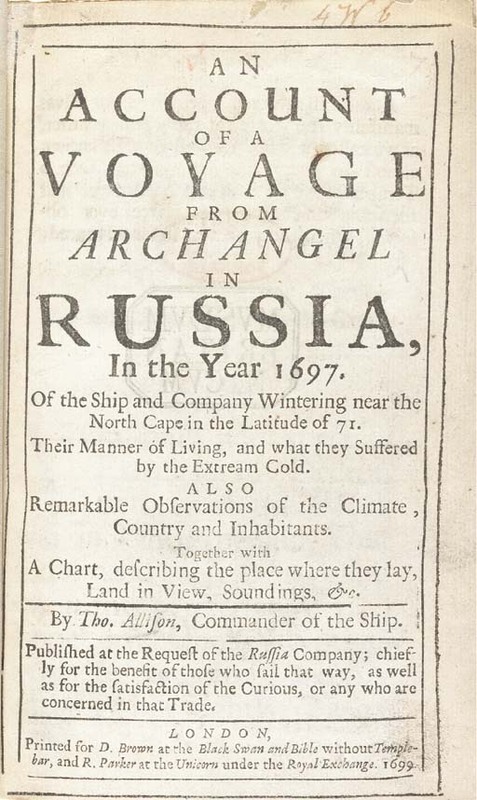 An Account of a Voyage from Archangel in Russia, in the Year 1697. London: printed for D.Brown and R.Parker, 1699. Small 8° (170 x 108mm). 2 engraved charts, one folding. (The folding chart shaved into image area along lower edge, small rust-hole in E8.) Bound to style in 20th-century black morocco gilt, covers panelled with inner cornerpieces of stylised vases of flowers, spine in six compartments with rasied bands, red morocco lettering-piece in the second, the others with overall repeat decoration in gilt, gilt turn-ins, comb-marbled endpapers, gilt edges. Provenance: British Museum (stamps, and 1831 duplicate sale stamp); sale: Bonham's, 24 June 1997, lot 41. First edition of this very rare work, one of the earliest English accounts of life in the arctic regions. 'While in command of the ship Ann, of Yarmouth, of 260 tons, in the service of the Russia Company, [Allison] left Archangel in the White Sea on his homeward voyage, on 8 Oct. 1697. After beating about for seventeen days off the coast of Russia and Lapland, he found himself... twenty-one miles N.E. from Nord Kyn, the northernmost point of Europe and Norway... Two days later... he sighted North Cape, and ran for shelter... A perusal of his journal... serves to show that he finally anchored in a small but secure harbour on the west side of what is now known as Porsanger Fjord, probably Saernoes Pollen, where he... was forced to winter. It was during this period... that his famous journal was written, which is a faithful record of the daily experiences and trials of himself and his hardy crew. Such was the intense cold on 1 Feb. 1698, that, in order to write his journal, "a boy had to thaw the ink as oft as he had occasion to dip his pen"... After enduring all the hardships of a severe Arctic winter with the loss of only one man, the Ann left..[her harbour on] 26 March 1698, and on 24 April following finally reached Gravesend' (DNB). Bibl. Norvegica II.6792; Wing A-1217.